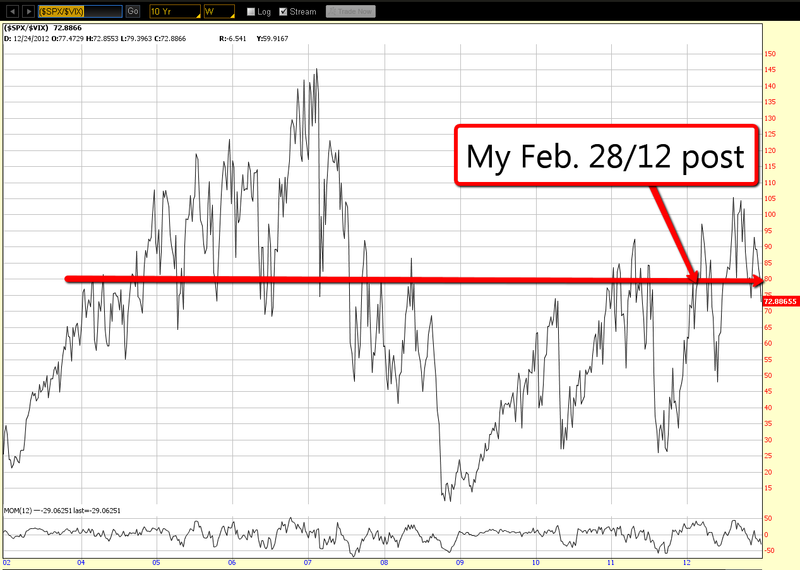 My post of February 28th of this year gave an 80% chance of another spike on the VIX this year. 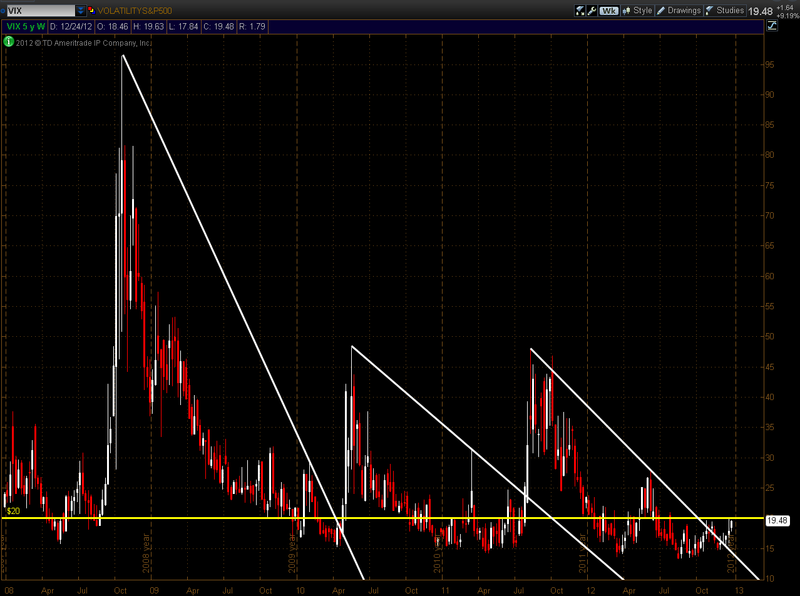 While that scenario threatened to occur mid-year, volatility subsided and has remained relatively quiet this year. 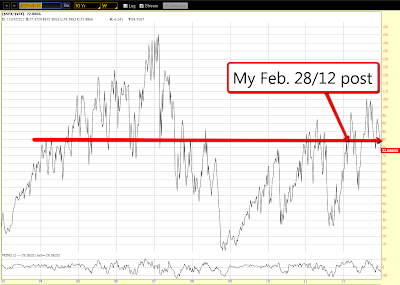 However, with only three trading days left, I thought I'd provide an update on this topic. 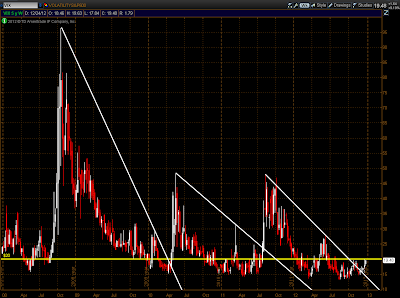 The Weekly chart below shows the VIX pushing up against a major resistance level around 20.00. 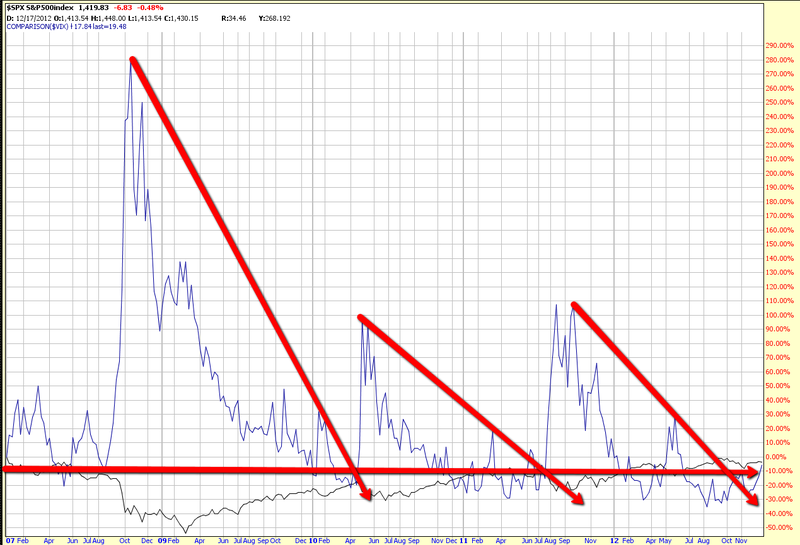 A close and hold above 20.00 may produce such a spike...if not this year, then in (possibly early) 2013. The Weekly ratio chart of the SPX:VIX shows that the SPX has weakened on rising volatility, that price has fallen below a major support level, and that the Momentum indicator has fallen below zero again, after failing to continue pushing to new highs. 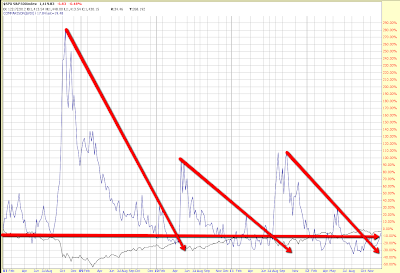 The Weekly comparison chart below of the SPX and the VIX confirms that volatility is overtaking any former strength of the SPX at the moment. All in all, these three charts are worth tracking over the next few days/weeks, particularly as the "Fiscal Cliff" issue remains unresolved and the "Debt Ceiling Limit" is fast approaching, giving extra fuel to the high odds of another spike in the VIX, sooner rather than later. After all, Ben Bernanke did say recently that Fed monetary policy alone cannot solve America's unemployment and economic woes...a change in fiscal policies will be required, and without bi-partisan cooperation on these (and many other such) issues, I would say we'll see a spike in the VIX at some point soon.